"May the odds be ever in your favor." This famous quote finally comes to the big screen in The Hunger Games. This science fiction action-drama film directed by Gary Ross and based on the novel of the same name by Suzanne Collins. The film focuses on sixteen-year-old Katniss Everdeen, who lives in a post-apocalyptic world in the country of Panem where the countries of North America once existed. The Capitol, a highly advanced metropolis, holds absolute power over the rest of the nation. The Hunger Games are an annual event in which one boy and one girl aged 12 to 18 from each of the 12 districts surrounding the Capitol are selected by lottery to compete in a televised battle in which only one person can survive. 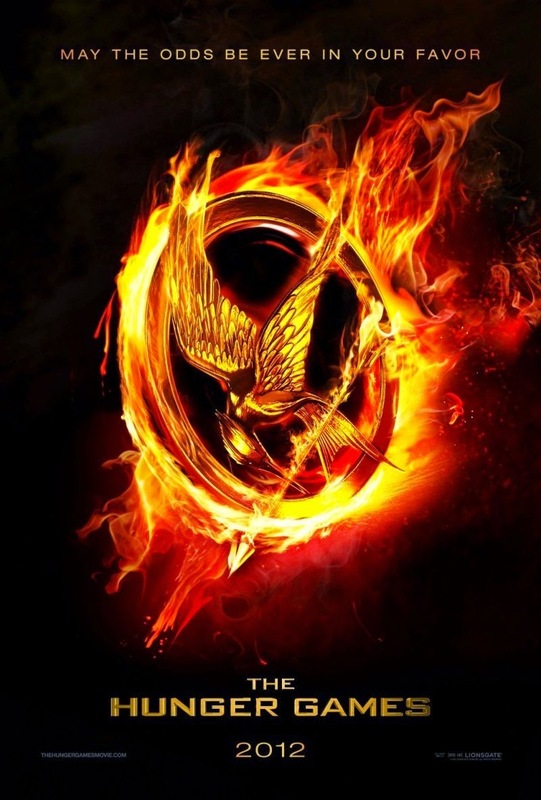 Development of The Hunger Games began in March 2009 when Lions Gate Entertainment entered into a co-production agreement with Color Force, which had acquired the rights a few weeks earlier. Collins collaborated with Ray and Ross to write the screenplay. The screenplay expanded the character of Seneca Crane to allow several developments to be shown directly to the audience and Ross added several scenes between Crane and Coriolanus Snow. The main characters were cast between March and May 2011. Principal photography began in May 2011 and ended in September 2011, and filming took place in North Carolina. It stars Jennifer Lawrence, Josh Hutcherson, Elizabeth Banks, Liam Hemsworth, and Woody Harrelson. The cast gave superb performances, especially Lawrence. Lawrence's performance was superb, it is most certainly better than Kirsten Stewart's performance in the Twilight series. Lawrence was perfect as Katniss, there is very little softness about her, more a melancholy determination that good must be done even if that requires bad things. She has finally become a major box office star! She first officially became an actress with the film The Winter's Bone (2010), which earned her an Academy Award nomination. Not bad for a now rising artist. For Hutcherson also gave a superb performance as Peeta Mellark. He gave a atypical action-hero approach to the role and brought vulnerability to his character, which is a nice for a change. Usually it has always been the male heros saving the damsel in distress. But in this, it’s the other way round. Everybody in this film were perfectly cast, just like the cast of the Harry Potter films. The Hunger Games isn't perfect, but, I’m sure, for fans of the books, it's a nice supplement to a book series that everybody loves. Being so faithful to the book is both the movie's strength and weakness. The movie unfolds exactly as written in the book, so there is little room for surprises or discoveries. For fans, what more can you ask for? To conclude, it’ll enthrall even the most cynical of moviegoers. The script is faithful, the actors are just right, the sets, costumes, makeup and effects match and sometimes exceed anything one could imagine. It’s off to a good start! "Mars. So you name it and think that you know it. The red planet, no air, no life. But you do not know Mars, for its true name is Barsoom. And it is not airless, nor is it dead, but it is dying. The city of Zodanga saw to that." This is what’s going down in Disney’s John Carter. This epic science fiction action film directed by Andrew Stanton and produced by Walt Disney Pictures. Based on the interplanetary adventures of John Carter from Edgar Rice Burroughs' Barsoom series. 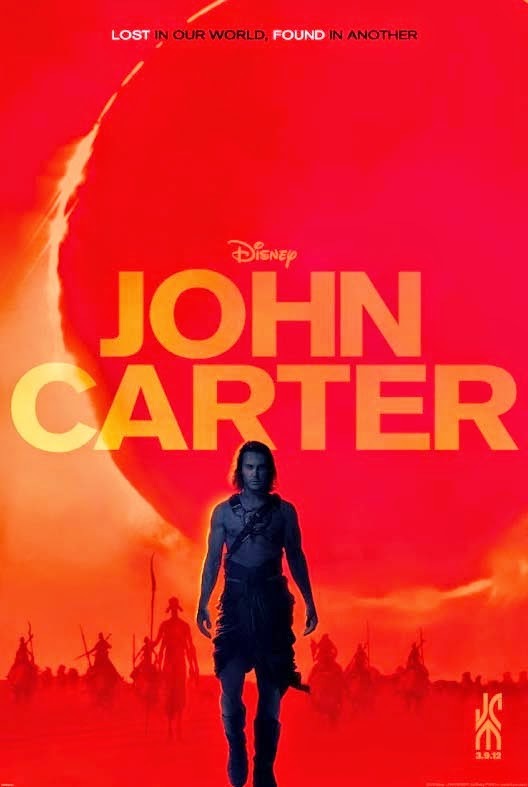 The film centers on Former Confederate captain John Carter who is mysteriously transported to Mars (Barsoom) where he becomes part of a conflict between the various nations of the planet. Carter takes it upon himself to save Barsoom and its people from a growing threat. Andrew Stanton, director of the animated Pixar hits WALL-E (2008) and Finding Nemo (2003), lobbied the Walt Disney Studios to reacquire the rights from Burroughs' estate. He then lobbied Disney heavily for the chance to direct the film, pitching it as "Indiana Jones on Mars." The studio was initially skeptical. He had never directed a live-action film before, and wanted to make the film without any major stars whose names could guarantee an audience, at least on opening weekend. The screenplay was seen as confusing and difficult to follow. But since Stanton had overcome similar preproduction doubts to make WALL-E and Finding Nemo into hits, the studio approved him as director. By 2008 they completed the first draft for Part One of a John Carter film trilogy; the first film is based only on the first novel. In April 2009 author Michael Chabon confirmed he had been hired to revise the script. Following the completion of WALL-E, Stanton visited the archives of Edgar Rice Burroughs, Inc., in Tarzana, California, as part of his research. Jim Morris, general manager of Pixar, said the film will have a unique look that is distinct from Frank Frazetta's illustrations, which they both found dated. He also noted that although he had less time for pre-production than for any of his usual animated projects, the task was nevertheless relatively easy since he had read the Burroughs' novels as a child and had already visualized many of its scenes. The film stars Taylor Kitsch, Lynn Collins, Samantha Morton, Mark Strong, Ciarán Hinds, Thomas Haden Church, Dominic West, James Purefoy, and Willem Dafoe. The cast gave disappointing performances, ranging from just plain to total utter cliché despite the effort. John Carter is an unqualified disaster. It fails so completely that you might suspect Mr. Stanton sold his soul to obtain the success of Finding Nemo and WALL-E and the Devil has just come around to collect. It is the most scandalous cinematic waste I have ever seen since Battlefield Earth (2000) and Heaven’s Gate (1980), and I've seen both. This is a movie that has destroyed the director's career. This is a movie that lost so much money it is literally a major financial loss for an American studio. This is a movie about a man from Virginia who is trapped on Mars and who is in the middle of an epic struggle between good and evil. This is a movie that stars Taylor Kitsch as a warrior who can "jump". This is a movie in which Mars is called "Barsoom". This is a movie that has five minutes of uninterrupted talking about what is right and what is wrong (I suppose). This is a movie that defies belief. Even though it deserves praise or recognition for its stylistic visuals and special effects, it has to be one of the worst films ever made and one of the worst films of 2012. 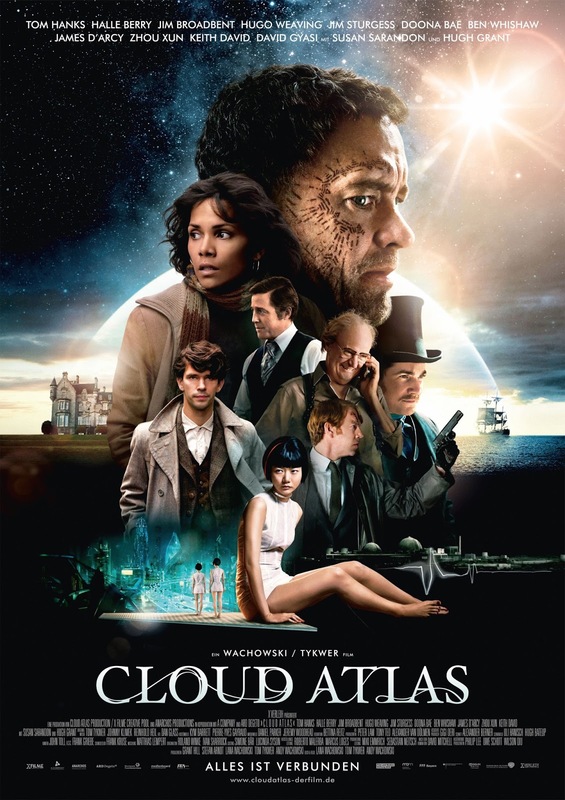 Film Review: "Cloud Atlas" (2012). "Our lives are not our own. From womb to tomb, we are bound to others. Past and present. And by each crime and every kindness, we birth our future." This is at the heart of Cloud Atlas. This science fiction film written and directed by The Wachowskis and Tom Tykwer; adapted from the 2004 novel of the same name by David Mitchell. The film has multiple plots set across six different eras, which Mitchell described as "a sort of pointillist mosaic". The official synopsis describes it as "an exploration of how the actions of individual lives impact one another in the past, present and future, as one soul is shaped from a killer into a hero, and an act of kindness ripples across centuries to inspire a revolution". Filmmaker Tom Tykwer revealed in January 2009 his intent to adapt the novel and said he was working on a screenplay with the Wachowskis, who optioned the novel. By June 2010, Tykwer had asked actors Natalie Portman, Tom Hanks, Halle Berry, James McAvoy, and Ian McKellen to star in Cloud Atlas. By April 2011, the Wachowskis joined Tykwer in co-directing the film. In the following May, with Hanks and Berry confirmed in their roles, Hugo Weaving, Ben Whishaw, Susan Sarandon, and Jim Broadbent also joined the cast. Actor Hugh Grant joined the cast days before the start of filming. During four years of development, the project met difficulties securing financial support; it was eventually produced with a $102 million budget provided by independent sources, making it one of the most expensive independent films of all time. Production began in September 2011 at Studio Babelsberg in Potsdam-Babelsberg, Germany. Tykwer and the Wachowskis filmed parallel to each other using separate camera crews. Although they shot scenes all three together when permitted by the schedule, the Wachowskis mostly directed the 19th-century story and the two set in the future, while Tykwer directed the stories set in the 1930s, the 1970s, and 2012. Tykwer said that the three directors planned every segment of the film together in pre-production, and continued to work closely together through post-production. Warner Bros. Pictures representatives argued they were happy with the film's 172-minute running time, after previously stating that it should not exceed 150 minutes. Tom Hanks, Halle Berry, and Jim Broadbent lead an ensemble cast that includes Hugo Weaving, Jim Sturgess, Doona Bae, Ben Whishaw, Keith David, James D'Arcy, David Gyasi, Susan Sarandon and Hugh Grant. Because of the nature of casting on the film, the directors told the actors to think of their roles as a "genetic strain" rather than a series of individual parts, with actions in one story-line affecting another. Despite the cast gave unique and varied performances throughout the film, one could not help in watching some of the performances fade in certain parts and think some of the characters could have benefitted from more development as those characters were underdeveloped and/or underused. Some of the scenarios border on illogical, but the diverse characters and the creative intersections between their stories keep Cloud Atlas compelling.